Add some style to your FR wardrobe with this 100% cotton 6.5 oz. Wrangler flame-resistant henley. This 6.5 oz. lightweight, flame-resistant work shirt from Wrangler will keep you comfortable and safe all day. This 7 oz. Bulwark flame resistant button up work shirt offers comfortable and durable protection for the job. This 7 oz. 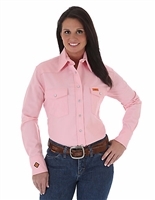 Wrangler women's flame-resistant Western shirt gives you the protection you need and the style you want. This Carhartt 6 oz. flame-resistant button-up shirt is durable and lightweight. This 7 oz. Carhartt flame-resistant button-up shirt is both durable and stylish. This American Made National Safety Apparel flame-resistant long sleeve t-shirt is made with durable and breathable FR-treated cotton. This National Safety base layer shirt keeps you cool on warm days and warm on cold days. This 7.25 oz. 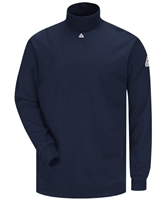 Bulwark flame resistant mock turtleneck offers comfortable and durable protection for the job. Ariat's new 7.2 oz. long-sleeve flame-resistant athletic-cut crew shirt is comfortable enough for a base layer, strong enough to be the only layer, and cool enough to wear on your day off. This tough Ariat flame-resistant shirt is made for ultimate performance and action. A hard-working shirt with the same good looks and great fit. Flame-resistant for hazardous work environments. Carhartt's flame-resistant 6.75 oz. long-sleeve t-shirt is a must have for your FR gear. This women's Carhartt flame-resistant 7 oz. twill work shirt is comfortable, durable, and will keep you safe on the job. This women's Carhartt flame-resistant 6.75 oz. long-sleeve t-shirt is a must have for your FR gear. This American Made National Safety Apparel flame-resistant henley is made with 100% FR-treated cotton. This Bulwark 9oz. fire-resistant front-zip jacket will give you comfortable and lightweight protection. This Bulwark 7oz. fire-resistant shirt is lightweight, flexible, and comfortable, and safe. Ariat's 7.2 oz. long-sleeve flame-resistant athletic-cut henley is durable, comfortable, and will keep you safe on the job. Carhartt's flame-resistant 6.75 oz. henley shirts have always been a top choice for FR work shirts. Ariat's new 7.2 oz. long-sleeve flame-resistant crew shirt is comfortable enough for a base layer, strong enough to be the only layer, and cool enough to wear on your day off. This Carhartt 6.5 oz. 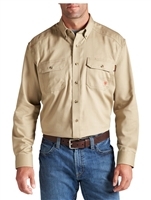 flame-resistant button-up shirt is durable and is built for comfort. This 11.5 oz. 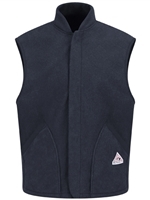 rugged Bulwark FR vest looks stylish and will give you a lot of warmth and protection. This National Safety Apparel flame-resistant utility shirt is proudly made in America and is built to last. This 11 oz. 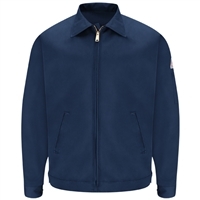 Bulwark flame-resistant premium fleece liner is built to be strong and soft, and to keep you warm and safe. 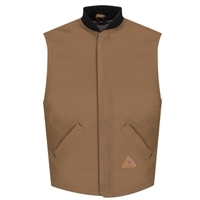 Carhartt 's FR Mock Neck Vest is a great way to stay both warm and safe when your'e working in cooler temperatures. This is National Safety Apparel's 14.25 oz. durable flame-resistant pullover hoody, which is also Made in the US. This is National Safety Apparel's 14.25 oz. durable flame-resistant front zip hoody, which is also Made in the US. This US- Made National Safety Apparel flame-resistant 3-season jacket has it all. Protective, durable, and versitale. Ariat's flame-resistant Polartec pullover hoody has an athletic and comfortable, with safety top of mind.